The acclaimed Jack-O-Lantern Spectacular presented by Citizens Bank will return to Roger Williams Park Zoo in Providence with shows running nightly from October 3 through November 3. This highly anticipated annual event features a breathtaking display of 5,000 illuminated jack-o-lanterns, with more than 125 of them artistically carved and displayed in scenes to play out the annual theme,"Pumpkinville, USA." Situated on the Zoo&apos;s picturesque wetlands trail, the event has won praise from across the nation for its amazing artistry and appeal as a unique family-friendly autumn destination. More than 100,000 people have come in each of the past three years to enjoy the nighttime show, and last year&apos;s Spectacular set an all-time record of more than 110,000 visitors. Admission starts at 6 p.m. and ends at 10 p.m. Sunday through Friday, 11 p.m. on Saturday. The trail closes one hour after the last ticket is sold. The Spectacular was founded in 1988 by John Reckner, formerly an Oxford, Massachusetts mail carrier. Mr. Reckner, his family and friends continue to produce the show which first came to RWP Zoo in 2001 and returned to the Zoo in 2009 after a 4-year hiatus. 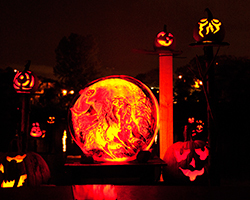 This team of professional pumpkin carvers, called Passion for Pumpkins, spends 6 - 8 weeks creating the magical display set on the Zoo&apos;s wetlands trail amid special lighting and themed music. They keep carving and enhancing the displays throughout the life of the show - the carvers expect to go through about 20,000 pumpkins during the course of the 30 day-run. At the end, the pumpkins are collected and composted. What nights have the shortest wait time to enter the pumpkin trail? It depends on attendance, which is often lower on Sunday through Wednesday nights than it is on Thursday through Saturday. Regardless of the day of the week, the line to get onto the trail is generally shorter either very early in the evening (be in line to purchase tickets by 5:30 p.m.) or later in the night (in line for tickets after 8:30 p.m.). Surprisingly, attendance tends to be much lighter on Halloween, and also on the following evenings. Is there any way to avoid the lines to buy tickets and to get into the trail? The nightly meal option, purchased in addition to your admission ticket, includes express access to the pumpkin trail. Friday through Sunday, diners enjoy a delicious Harvest Buffet. On Monday through Thursday, simpler Moonlight Meals are prepared to order. Admission for the meals runs from 5 p.m. - 7 p.m. Whether or not a meal is in your plans for the evening, consider stopping by the Zoo during the day you plan to attend the Spectacular. You can buy your tickets between 9 a.m. and 3:30 p.m. and then come back later. Note, depending on the day of the week, you may still find there is a line to get to the Trail itself but you will have minimized your wait time. The Zoo has free nightly parking, which is available on a first come, first served basis. Additional parking is available on the street in the Park. New this year, we also will offer premium parking for $10 per car. This will be available nightly in the lot right next to the show entrance and exit gates. Again, this will be available on a first come, first served basis. For pricing and more detailed information about the Jack-O-Lantern Spectacular, visit rwpzoo.org. 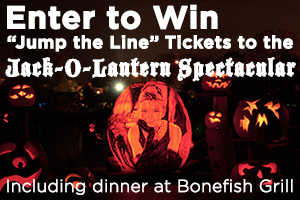 The PWCVB has partnered with Roger Williams Park Zoo for an eerie-sistable prize package this Halloween. Simply fill out the form here to enter. Contest ended October 25, 2013. Jan Mariani heads up the Public Relations department at Roger Williams Park Zoo following a long stint at United Way of Rhode Island. An enthusiastic resident of the Greater Providence area for many years, she is particularly fond of the areas' natural beauty, diverse cultural venues and extraordinary restaurants.